If you are an actor, it’s hard to imagine reading Bruce Miller’s book without experiencing at least a passing desire to go study with him. If you are an acting teacher or a director, you will find a cornucopia of material to inspire your own pedagogy, or at least to adapt to your own classroom use. 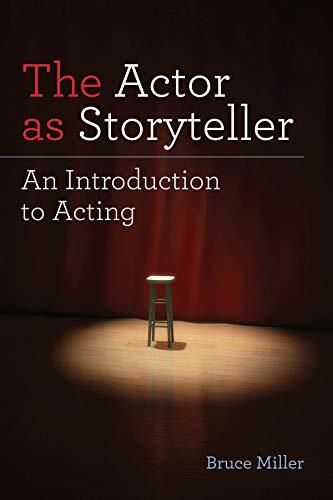 There are numerous approaches to teaching acting, but the author pinpoints one truth on which they almost all agree: The actor is a storyteller. The actor tells the playwright’s story, the character’s story, and, to some extent, her or his own story. Mr. Miller makes it clear that his aim is to educate the whole actor and not just to give tips on how to look good on stage. His holistic approach, distilled from his years of experience as a teacher, workshop leader, and director, gives a panoramic view of what the new, and especially the young, beginning actor needs to know; however, there is very little in the book that wouldn’t be found valuable even to a working practitioner of the acting craft. The book begins by defining the various incarnations of theater and explaining how the actor fits into each of them. He contrasts the traditions of live theater with film and television acting. Mr. Miller is a relaxed and tolerant-sounding teacher, but he has no patience for the starry-eyed illusions that attract many young students to the craft. The main thrust of the volume is the craft itself. There is a brief sketch of the history of the major acting methods being taught today. Bruce Miller gives a clear description of the theories of Konstantin Stanislavski, the famous Russian theater innovator, as well as those of Lee Strasberg, the American actor who filtered Stanislavski’s work through his own ego. The voice of the author as teacher rings out from almost every page. Mr. Miller explains why craft is important and then gives clear instructions on such craft-based topics as how to analyze and study a script. He guides the reader through the process of making creative choices in the building of a character, and gives comprehensive exercises that allow the student to put the author’s teaching to work. There are details and suggestions on how to approach rehearsals, and advice about auditions. And Mr. Miller never allows the reader to lose sight of the practical aspects of the actors’ world. There are no vagaries in The Actor as Storyteller. Everything, right down to the section on “Knowing the right people” is realistic, specific, and precise. Mr. Miller has set out a very clear map that will be valuable to beginners and experienced actors alike. Martin A. David is an artist who includes theater in his professional pursuits.